Looking for the proper way to cleaning jewelry at home? Learn how to make your jewelry sparkle like the day you brought it home. You can find tons of ways to clean jewelry, like using toothpaste to help make your diamonds shine, using club soda for certain jewels, and more. Here are some safe and ideal ways to clean your jewelry at home. Not all jewelry should be cleaned the same way, as one method used for silver could ruin a set of pearls. You can clean diamonds lots of different ways, but here is one way I like. Take warm soapy water, I just use Dawn dish soap, and let it soak for a few minutes. 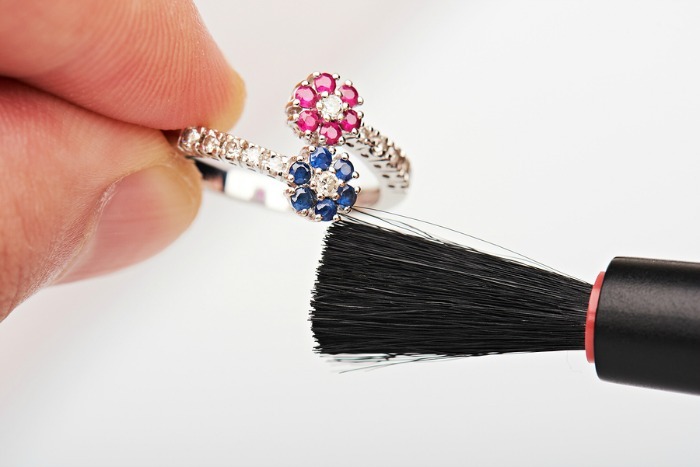 Then take a soft-bristle brush or even a toothbrush, and gently clean your diamond and around it. Rinse and then pat it dry with a soft cloth. This will really help remove any residue from hand lotion and more that can build up over time. Over time silver can tarnish, and create a chemical reaction resulting in changes of colors of your jewelry. Take a bowl and line the bottom with aluminum foil. In a pan bring 1 cup of water to a rolling boil, and pour that into the bowl. Next, add 1 tablespoon of baking soda, it will bubble a bit. Then place your jewelry in the dish, and with a fork or spoon push it down and make sure it touches the aluminum foil on the bottom. Let this stand for five minutes, then fish it out, and let it dry, and the tarnish should be gone! Pearls are very delicate so you have to be very careful with them. When your pearls are dirty, you will want to wash them with 1 teaspoon of Woolite laundry soap diluted in 1 quart of water. 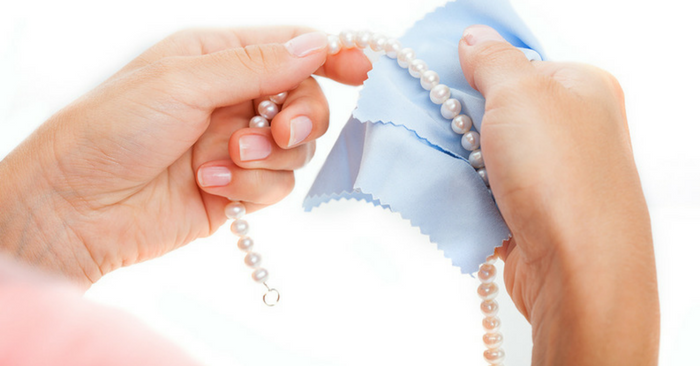 Immerse your pearls in solution for just 10 seconds, and then wipe them off with a soft cotton cloth, and then lay them out to dry. If you have untarnished gold jewelry, just mix in a few drops of mild dish soap with water and use a soft-bristle brush to clean. If you have some tarnish on your gold, use ammonia (few drops), warm water, and mild dish soap. Let the gold sit in the water for a minute and then carefully brush the jewelry until it comes clean. 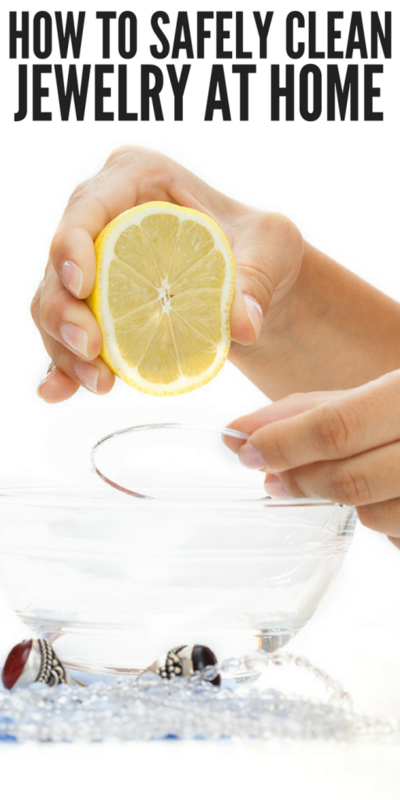 Take warm water with a little bit of mild dish soap, and use that with a soft-bristle brush to clean. Don’t ever submerge your stone in water as this can seep into the pores and cause discoloration. Just wipe it clean, and dry immediately. 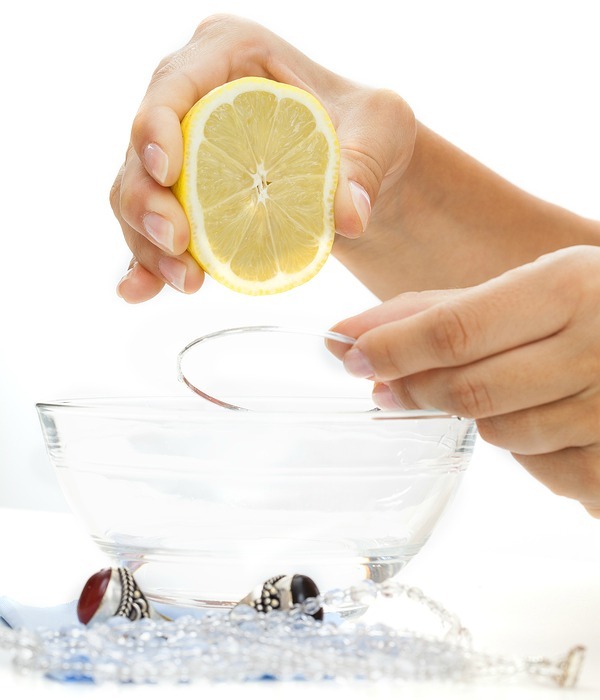 Grab a bottle of club soda and let your jewelry soak for ten minutes in the soda. Then use a soft-bristle brush if need be to wipe away any buildup. Rinse in water and pat dry with a soft cotton cloth when finished. This is a very soft metal so you have to be careful as it scratches easily. 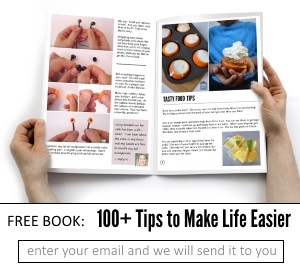 Use a polishing cloth or a clean sponge that is very soft to remove residue and polish it. What’s your favorite method for cleaning jewelry at home?